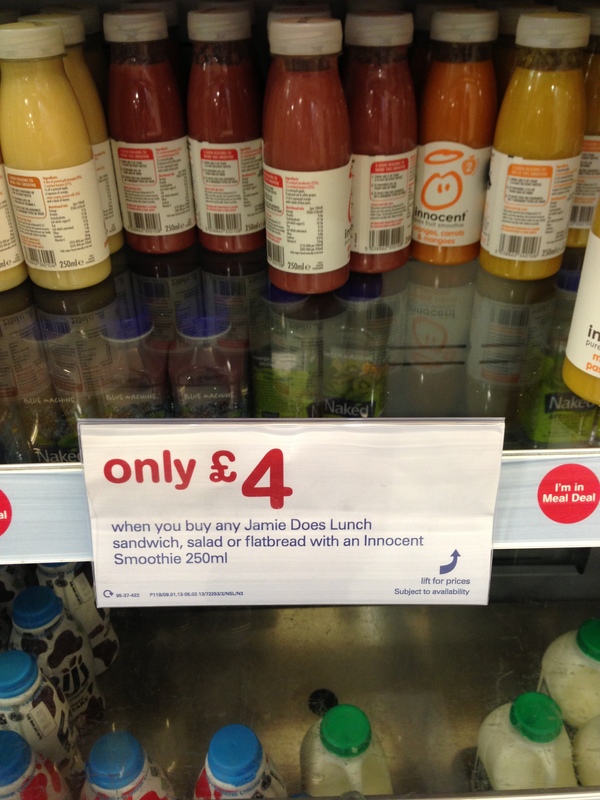 I have written about Jamie Oliver in Boots a few times and the brand asking to extend the lunch price from £3.29 to nearer £7.00. A lovely idea, but unlikely in practice. As much as I wanted to try it, I couldn’t quite bring myself to buy the sandwiches. Call it mental block or sheer tightwaddiness, But finally, the other guy blinked and they have added the whole Jame Oliver range into a form of meal deal. It’s not within the full £3.29 spectacular, but rather a £4 partnership with Innocent. This is quite clever. Brands hang out with brands that work for them and make each other look good. By sharing the deal, the two brands feed off each other and may both benefit. So, I bought one. A ‘Proper Salmon Sarnie’ and I have to admit it was up there with the nicest sandwiches I have ever had from a supermarket. Certainly equal to the taste of the ‘Taste the Difference’ sandwiches in Sainsbury’s, which are part of their £3 meal deal. So, maybe there’s hope for the range yet. Okay, I know it’s early for 2011 predictions, but after a good holiday, my thoughts were turning to what will happen when I get back to work. So this is what I predict will change – or start to change – for 2011. Parents have to let children have a bit of slack again, take some risks and make their own mistakes. Electronics are not a substitute for play, they are a substitute for imagination and our children will be far duller because of it. When they did go onto the beach, they were entertained for hours, with digging, building, wave jumping, skim boarding and even skimming stones. I don’t want to sound like a real old fart, but I honestly believe that it’s changing. We have enough electronic stuff. We have so many different ways to take in our news now, be it iPad, phone, RSS, texts, or heaven forbid, newspapers. How do we choose? Mostly we seem to dip in and out of all of them, so delivery of great content across every platform will become vital. But deciding when to take this in will also grow. Rather than just grazing and developing such a low boredom threshold that we never actually take any of it in, will stop, so I predict that long copy (if it’s relevant, engaging and well enough written) will make a comeback. Twitter is fine, but it’s all a bit Chinese meal. You are left wanting more, without ever getting full. I’m a little bored of it myself and am tweeting far less than ever before. So I’m going to be more defined about what I do and when. Our generation of 40 somethings have become very lazy drinkers with a glass of wine or two with every evening meal and then a thrash at the gym to try and work it off. The Telegraph and others reported this week that there has been the sharpest drop off in drinking since 1948 – and again, I’m not surprised. The drinks we are now consuming have gone the same way as our food. Full of additives and designed to a price point. If they can’t make it naturally, then they make it un-naturally. Find me a wine without a Sulphite in it these days and you are way above the everyday drinking range. Is that good for us? I doubt it. Are we getting more aware of what we eat? Without doubt. The gym market is busted. People who join gyms, don’t lose weight. They may shift it about a bit, but it very rarely drops off completely. So what’s the point? It’s much nicer going for a walk or a ride along the river on your bike, than sweating it out with beautiful people anyway, so why pay for the privilege? There are two gyms near me that are breaking new price points. One at £10 per month, literally across the road from Purple Circle’s studio and the other, that I go to is down at The beautiful National Watersports Centre in Nottingham and is only £15 per month. Great if you want to hammer the rowing machine looking over a lovely lake, but crap if you want to be seen by beautiful people. Kia started it with Cars, Vauxhall have half-heartedly followed suit with a lifetime warranty that’s chock full of caveats (not if you sell it, 100k miles, only if we service it, etc etc etc.). But for me, this means that things will be built better again. It’s no use offering a long warranty if you’re going to have to keep repairing it every few months. The only way around it is to build things to last, like they used to do, you know in the old days. I hired a Kia on holiday to see what it was like. It was actually fine. A bit like a domestic appliance, but as a cheap and cheerful vehicle, it was just that, fine. there is no doubt that we are not out of recession in the UK yet. The government’s announcement of where their cuts will fall that is due later this month or in October is keeping many on tenterhooks to see if they will be out on their ear and that will continue to curb spending. In a way this is related to the point above about warranties but I think it is more so. People are making more considered purchases. Either buying fewer better things that they have thoroughly researched on the Internet to find the best price, or zapped using the RedLaser App. If they can’t afford what they want, they are not buying cheaper alternatives, they are not buying. Full stop. I can see this continuing right through 2011 and maybe lifting the gloom for Christmas 2011. If all is doom and gloom around us, then we still want to feel good, so those that offer a dose of happiness will succeed, as long as it’s not too short term in its gratification. I’m not talking just about sweets and crisps, but about those that warm the soul too. They make you feel good about your purchase and allow you to reflect with a warm glow into the long term. Innocent still fall into this category as do the likes of Covent Garden and BeWILDerwood, but I think it will be a long, long time before we start buying Bernard Mathews or anything with an England Football logo on it – despite their win last night over Switzerland. I’m sure there’s more. Feel free to have a think and add your own thoughts. I’d love this list to grow and grow. If Howies, Innocent and Rachel’s Organic are the star brands now, well what’s next? Are all of our mega brands becoming a but samey? If imitation is the sincerest form of flattery and flattery will get you everywhere, perhaps that’s why all of the best brands of our age are all becoming a bit, well, samey. And, If green is the new black, organic is the new everyday, and hybrid is no longer just for those who prefer to knit their own yoghurt, I have to ask, what will come next as the real differentiators for our current mega brands that we all look up to? There is no doubt that any trend is just that, a trend. And trends come and go. I’m not even slightly saying that Howies, Innocent or Rachel’s have copied each other, it’s just that as these are at the front of the curve, the rest of the market will be following. Every new brand we are being asked to look at, needs to add a little hug here and there, a bit of planet kissing and some stout green nosing for good measure. They are all drifting towards a level of sameness that will slowly see the current heroes be caught and potentially overtaken. Unless they move their own cheese and get themselves into a new and worthwhile position before the others even get there, they will no longer be the top brands in their own sector, let alone any other sector. I think a change is a coming. I believe that brands grow so fast these days that they are likely to die just as fast. In the perfect market that we now live, where all of the people have all of the information a new brand can literally come out of nowhere and achieve the status of our current heroes. So where will this brand come from? A few pointers that have been gathered over lots of episodes of Trendwatching and lots and lots of reading around the subject. 1. It will be from the quality end. This recession ain’t ending fast, so people will buy fewer things but better quality things, that give them the status they seek. Everyday is mundane. It will be a treat that is a little naughty and a bit of a backlash against the goody goody era in which a 4×4 is the work of the devil. Once we all survive the Swine flu myth, we’ll want to kick back and live a little. If you achieve worldwide distribution overnight, you kill the golden goose. Leaving them wanting more, works. Like any normal distribution curve, the green revolution will fall off and the responsibility for greenness will be thrown back to the manufacturers. The public will simply expect them to do the green worrying for them. I’d love to know what people think this new brand or new market could be and whether they agree with my four points above. Answers on a patent application would be most welcome. Thanks for the image of his niece Sobrina to Corre Madrid. See more work here. The etiquette of Twitter – That would be Twittiquette then! I tweet therefore I am, but I listen too. Twitter isn’t that new to many people, but its scarily new to others and as such, the etiquette of how to use it is only now beginning to emerge. But to understand the etiquette, I think you first need to understand its purpose – or at least what I believe to be it purpose. I believe Twitter is for building likeminded communities. Groups of people from around the world who share some form of common interests. Those communities can be in many or any different areas. 1. In its most high profile form, this can be for celebrity watching. The likes of Britney and Ashton Kutcher, send out inane insights into their daily lives, that few but the most committed fans could possibly care about. The fact that these two have millions of fans between them, that hang off their every tweet, shows that some people must care. I’m not one of them. 2. For campaigning it works amazingly well. Barak Obama famously built his campaign and campaign coffers on the back of his connections he built through Twitter. No election anywhere in the world will ever be the same again. The people of Iran displayed their dissatisfaction with the voting system and twitter stayed open for them to give them a voice to the outside world. When anyone first saw Twitter, I would suspect that there were VERY few people who would have believed that it could have such a huge impact on the workings of world politics. 3. Finding and learning from likeminded peers has to me, proved the most valuable way to engage with Twitter. My work is based on the subject of branding, innovation, marketing and business psychology, so I am actively looking for people who talk about these subjects anywhere in the world on the Twitter network. I have open searches on Tweetdeck for these words (as well as Nottingham and Margate for other reasons) and can refer to anything that is written in these areas. It beeps at me every minute and can be hugely distracting, but eqally informative. If I see something that I think is valuable or leads me towards an article I find useful, then I will follow the person who posted it and begin to build some dialogue with them, by Retweeting their good bits and trying to read as many of their thoughts as they care to share. But what if they don’t follow me back? Well, for me, this is the wrong way to use the system. Maybe everyone isn’t saying this, but certainly those who choose deliberately to not follow you back, are. It’s like big business sending out emails from ‘donotreply email addresses’ They are effectively saying that they don’t care what you say, but are asking you to click through and buy from them. I covered this in more detail in the piece last week about Social media. So, if after a week or two, people are still choosing to not follow me back, I stop following them. If they don’t care what I am saying, why should I care about what they are saying? Are they really so wise, that they have nothing to learn at all? Not following is probably okay, or at least understandable for celebrities. I do think that it is a bit arrogant for them to only follow their fellow celebs, just to show how well connected they are, and to reinforce the fact that we are not in their ‘A’ list of friends. So it comes back to the purpose of Twitter for the masses. Is it to build communities or relationships or just to shout about the fact you are on a train or eating your lunch? If it is about relationships, then speaking without listening won’t keep you in a relationship for long. See how you get along for a day at work ignoring everything your colleagues say to you. As Innocent Smoothies taught me in their book. If you’re talking you’re not listening. So, do the right thing. Listen as well as speak. This is one of the most exciting and informative presentations about Social media I have ever seen. There are so many lessons to come from it that it seems obvious to pick to what I think are the main few for us to learn from in case you don’t have time to go through it yourself. 1. If your product is crap, no amount of social media will make it less crap. 2. Listening is the most important thing you can do. Social media is about building dialogue and not diatribe. As innocent said here, when you are talking, you are not learning. Most research departments do not send out the emails, it’s the sales departments and they rarely ever speak. 3. Sending emails from ‘do not reply’ addresses is just plain rude and bad for business. What you are saying is that ‘We are speaking and not interested in what you are saying, so shut up’ – unless you want to place an order – in which case ring this 0800 number or click through to our friendly smiling website. 4. 85% of social media users have said that they expect companies to have a social media presence and then use it to actually interact. 5. Having a strategy to engage is the way forward. Look at all the social media options, decide what is right for you and then dive in. 6. Stop thinking social media campaigns and start thinking social media conversations. 7. And the three final rules in summary. If you don’t measure its effect, how do you know if its working? And thanks to Andy Hanselman for showing me this presentation via Twitter. There are few books that I have ever read that I have enjoyed more than this, because it is so obviously living its own values throughout every single element of the presentation. From the beautiful simple writing to the clear, friendly design, it is a must read for anyone who wants to truly understand what branding is really about – from the masters of what branding is all about. So what are the key learnings for me that came from reading and really thinking about what they are saying. Well, there are lots of them, but these are my top ten which made a real and lasting impression. 1. You don’t need masses of experience to start a business, but you do need an awful lot of determination and a brilliantly differentiated idea. 2. If you don’t get it right first time, it is not a failure, it is a potential lesson on the way to getting the right answer. 3. The beauty is in the detail. Its easy to do the big things right, but the differentiation comes in the small stuff that no-one else does like you. 4. Create a set of values that you really believe in and then deliver them ruthlessly at every single level of the organisation. Have fun, you spend a lot of time at work. 5. Recruit and retain brilliant people, even if they are not the same as you, but make sure you have a clear role definition for all of them. 6. Give people real responsibility to manage their own areas and then measure them on that. If they don’t measure up, help them move on. 7. Profit is not a dirty word, it allows you to continue to do more of what you do and live your values even more clearly. 8. Keep listening as you aren’t learning if you are talking. Look for inspiration everywhere, however random. 9. Keep evolving as a business as if you stand still you will slowly die. 10. Try new stuff. It may well work. If it does, do more of it. Overall, this is a superb book that I found myself actually slowing down on whilst I was reading it so I wouldn’t finish it too quick. Brilliant, just brilliant. You can buy your very own copy (and I urge you to do so, by clicking here. And finally, thanks to the rather excellent ViZZZual.com for use of his image. Oh, and when you read it, look out for my new friend Rowena who is the very smiley one on the Banana phone in the front of the book. Hello. I’m reading the rather excellent book about Inocent Smoothies called ‘A Book About Innocent: Our Story and Some Things We’ve Learned’ Which is absolutely excellent and really confirms many of our thoughts about how real branding works. There seems to be so much power in the detail that they take seriously that anyone in any industry can learn from reading this enjoyable book. I’ll write a full review in the next few days when I’ve finished it, but had to relay one of the brilliant stories in it. Innocent often put ‘joke’ ingredients in their listings and on one, they added the odd ingredient of ‘Two Plump Nuns’. This was designed to show their purity and innocence – a lovely and funny thought – but really not one to be taken too seriously – who would really be thinking there was bits of nun in it, plump or otherwise? But not according to the Trading Standards people, who after some to-ing and fro-ing wrote them a letter that essentially said “either you add in two plump nuns to your smoothies, or take them off your ingredients list. You can buy it here and I would absolutely recommend you do. I bought a bottle of the superfruit smoothie today which was lovely and has a brilliant story about the bees knees on the side, so I thought I would write and let them know how much I enjoyed it and how much I was enjoying the book. Thanks for your e-mail. Great to hear how much you’re enjoying having a read of our book and the Plump Nuns story. Hope you like the rest of the book too. Now I guess I was expecting a reply, but a personal one in 8 minutes is exceptional and the reason they are such a fabulous business ad a brand that any sensible business should envy and learn from. I am now a devoted fan!